Staying in Crowne Plaza in Sydney’s Coogee beach was definitely a good choice made by me, I was so tempted to book myself a room in one of the hotels available around the city area but I was advised against it as I will not have the peaceful walk around that I want. Moreover, if I want to visit the city, I can just drive. Crowne Plaza Coogee beach, as the name suggested, the hotel is just located a road across the smaller yet beautiful and popular Coogee beach in Sydney. For my first time in my life, I learnt that along the famous Coogee beach, there is a man made pool at one end of the beach for people to swim in without fighting the strong current in the sea at any time. It was definitely a breathtaking sight to behold while looking across the beach under the sun while the weather is rather cooling. Summer was over and only few visitors were basking themselves on the beach, so I took this chance to compose my frame at my own sweet time. The image below was taken with 16-35mm f2.8 L on 5D II but was cropped a little more to emphasize the building and the man made pool as my main object. Thank you! You will certainly love it too if you are there! This looks like the most perfect place! Lucky you! Thank you! I like this place too! Yes yes! I have never seen one man made pool on the beach either! It is really cool! How wonderful to see this pool! 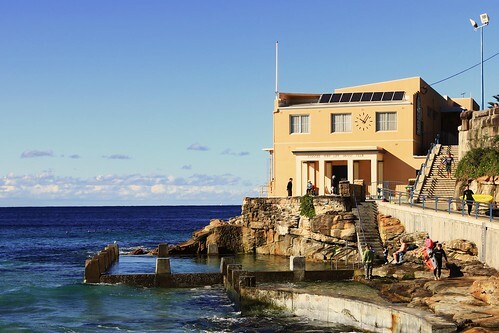 We walked from Bondi Beach along the coastal path, past Coogee and the pool, a couple of years ago. I´m sure you have done the walk already! Lovely photo – you´ve captured it beautifully. Well done, Alex. Thank you! Hehe! It was cold at that time so I skipped the coastal walk. But both beaches are just so beautiful! I love the pool within the ocean. You make me crave for a beach vacation now! Yea! The beach is just so inviting right? I’m never tired of beach vacation! Looks like a really wonderful place for a vacation. Exactly! But during that time I was there, the weather was cold. I bet summer is the best time for vacation there! It looks so lovely and peaceful. Thank you! Feel free to follow my blog! Your blog is awesome! Thanks you! Ya! I only knew from the internet that this is a famous beach too! The colour of the sea there is amazing. I love this color of the sea! Great lighting! You have a real eye for photography. All your photos are wonderful. Nice shot. The light is nice, not too harsh. Great colours too. You are welcome! Thanks for dropping by! Thank you so much! I’m glad that you like my photo! Beautiful! This is certainly a place I would love to visit! You have a wonderful and colourful travel blog. Keep travelling. Me too! 🙂 Thanks for commenting!!! Yea I find it a nice place to be at! Awesome place.I would love to see it! BTW this pic goes as my wallpaper.Thanks for sharing! Thank you so much! It is my pleasure for my photo to be your wallpaper! Cheers! Yes it is a cool place to be! Thanks!! Now I follow you and your interesting blog. What a gorgeous place and fantastic photo! I will go back to Australia one day again! I haven’t really explore the place yet! Thanks for dropping by my blog! Cheers! Thank you! This photo is with minimum editing using photoshop! Thank you so much! Your comment is so true! Yes and it is one of the famous beach there! This looks like the place to be! I love how the pool blends in to the natural surroundings. What a neat place to be! Lucky you! Thank you very much! Yes! The man made pool blend in very well and provides real good calm water to swim in and yet its sea water! My son lived in Coogee for a semester while he was an exchange student at UNSW. Lovely place. My sentiment exactly! A lovely place!! It sure looks very nice! It is one of the famous beach there! Cheers! Very unique idea. Loving your blog by the way! Thank you~!! Feel free to follow my blog too! Thank you very much alangent!!! Great shot. It really takes me back as I used to live just around the corner from here! Oh that’s nice! I love Coogee beach, it is so beautiful! Thanks for your comment! Thank you for stopping my blog too!